I'm just home from two great weeks in hot, humid Ontario. Chatham at 41 degrees is too much for me. Chatham as 18 degrees is still challenging to me. It was so very humid, hot and...??? With that out of the way, I've just spent two great weeks sharing learnings and hope with Aboriginal students and communities. Non-Aboriginals have had a equal dose of who we are, what our challenges have been and where we see ourselves in the future. Miigwetch to both the Catholic and Public school boards for offering me the opportunity of sharing with your staff, students and parents. For many of our kids, pride, insight and a role model is a good beginning. 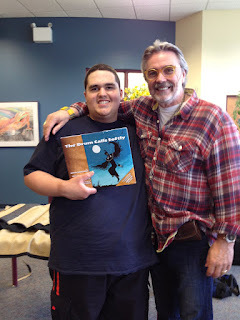 Pictured here is my new friend Andrew at John McGregor Senior Secondary in Chatham Andrew just won our Drum Calls Softly (and a small piece of my heart) for being a devoted and passionate reader. I'm home packing for the Halton School District, Lindsay and Thunder Bay.